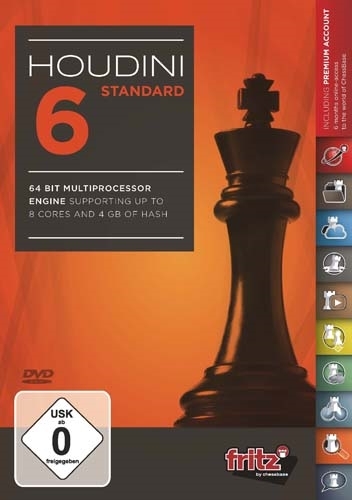 Houdini 6 - Standard - up to 8 cores "
Product Details Houdini 6 Chess Standard Edition (PC-DVD) Houdini 6 continues where its predecessor left off, and adds solid 60 Elo points to this formidable engine, once again making Houdini the strongest chess program currently available on the market. With Houdini 6, you not only gain in terms of computing power, but also in terms of time! The new engine delivers better performance even if you only let it calculate for half as long as the previous version! Houdini 6 has been put to the test in various areas and thoroughly refined in all the right places: position evaluation, search, time management and use of the endgame tablebases have been improved, as has parallel processing. Houdini 6 delivers particularly exceptional results on systems with a large number of CPUs, and can run up to 128 threads on high-end hardware. The enhanced "Tactical mode" transforms Houdini 6 into the most ingenious position solver of all time and improves again on the records held by previous versions in tactical benchmark tests. In addition, "Tactical mode" can now also be assigned an exact number of threads, giving you additional flexibility. Despite all the detailed technical improvements, Houdini has kept its creative and imaginative style of play, and where other programs see no future or are locked into a draw, Houdini delivers surprise after surprise with hidden resources. 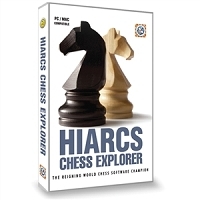 You can certainly look forward to using this latest version of the true wizard among the chess programs! HOUDINI 6 STANDARD Houdini 6 Standard engine: The engine can support up to 8 processor cores and 4 GB of hash memory Fritz 15 user interface Premium membership for playchess.com and your ChessBase Account (6 months) Online access to the world?s largest analysis database, ?Let?s Check?, with over 200 million deeply analyzed positions (6 months) System requirements Minimum: Pentium IV hyperthreading, 2 GB RAM, Windows 7/8, DirectX9, graphics card with 256 MB RAM, DVD-ROM drive, Windows Media Player 9 and internet access. 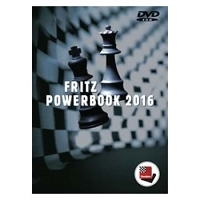 Recommended: PC Intel i5 (Quadcore), 8 GB RAM, Windows 10 or 8.1, DirectX10, graphics card with 512 MB RAM or more, 100% DirectX10- compatible sound card, Windows Media Player 11, DVD-ROM drive and internet access System requirements for ChessBase account: Internet access and current browser, e.g. Chrome, Safari. For Windows, OS X, iOS, Android, Linux.